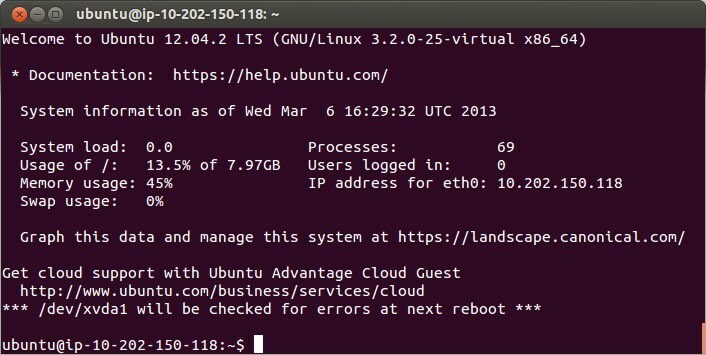 ubuntu is the default user name used on EC2 instances with Ubuntu default AMIs. ec2-23-22-122-111.compute-1.amazonaws.com is Public DNS, you can find it in EC2 management console > Instances > Description. First time you will be asked to trust public key, replay by writing whole word "yes". The authenticity of host '23.22.122.111 (23.22.122.111)' can't be established. ECDSA key fingerprint is 55:1b:99:99:a4:9c:eb:94:fd:7b:4f:11:5b:bf:94:7d. Hit Enter and then you will be connected. You do not have to create new Key Pair for every zone or region or instance, instead, use Key Pair Import and use the same on everywhere, it is a time-saver and I do not see the security issue, once you loose any of them it is too bad.